I am approaching being in the market for some early 60's 6cyl Merc's. Probably 850 up to 1100 with controls. While I know that with a little looking, I could find some cheap motors here and there, I don't have the expertise to properly rebuild these. I found the attached picture on the internet that is close to what I am looking for, but wow, what would take to buy a set of these!!! Doc Frankenmerc could build ya a couple of bee-you-ti-full FGS Mercs over the winter, I reckon! He's on this site, check out the "Mercury Outpost" forum and you can send him a Private Message. Where are you located, BTW? The Doc and I are both in the PNW. Tell the Doc that Ed sez he's got some work to do! BTW those beautiful Mercs in the pic you posted aren't FGS models, but Direct Reversing. Aka "Dockbusters". Even rarer to find a pair of 800 Dockbusters! But they sure would make a classic boat fly. They'd look really good on a Powercat. You asked what it would take to buy something like those......DEEP POCKETS. I guess if a person prices brand new motors and then compares that to the cost of having one of the professional experts virtually build you brand new vintage motors that are dependable and last, you would get value for what you pay for. Their hard work and time has to be respected, but I have seen happy customers who drive their new vintage motors with little worry. I drove my vintage 1965 used Merc, but never was sure how long it would run. After a few times out I found the previous owner had problems that were now mine. After a professional rebuild of the powerhead, I am able to really enjoy my motor with more confidence. Good luck in your decision making. If you can get one of the experts to find and build you motors or even find motors they have already done for others that might be willing to sell when they want bigger motors, you may also find a deal somewhere. List your request in the wanted section of the glassified adds and see if you get some responses. Also check with Doc Frankenmerc in a personal message and get the good Doctors advice. Also remember it is easier to sell motors later when you have a record of a reputable builder rather than just saying that your old motor ran last time I was out and have no idea how many hours are on it. Thanks for the information. I reached out to Doc and told him that Ed sent me.... wow, I hope that doesn't mean he'll raise the price... Anyway, I am located in the Midwest. Thanks for identifying the photo for me, I wasn't sure where I had gotten that from. I don't have any engines right now, and when I do run across them for sale, they are usually laying in a field or the back of a pickup. Sure it may be rebuild-able and I may even be able to do it myself, but it the long run it would be much better to have a reputable builders paperwork to back it up. Besides, I am looking for something I can mash the throttle on without feeling like I am just sitting there waiting for it to fly apart. I really like the look of the 850 but I have to admit that a little more horse power is always exciting. Ask the experts, because I believe there is a white Merc model that used a full gear shift... thinking 1961. Of course Doc likely could make one of the bigger hp black Mercs into an older looking white Mercury with decals to look older. From what I have seen on here, he is a brew master and creator of very unique functioning works of art. I agree about your comment of peace of mind with a reputable build. I had that uneasy feeling each time out and that feeling went away after a professional build since I cannot do it myself. I still carry a tow rope, etc just in case I do something stupid like forgetting to mix in some oil. Merc made "Cloud White" Inline Sixes in a variety of FGS flavors, including 70hp, 80hp, 85hp. A Merc 1000 90 cubic-inch powerhead will bolt right up to any of the 80 and 85hp bodies, as the physical dimensions are the same. Or just have a Phantom Black 1000 painted and decals installed for that retro look. BTW the 90-c.i. 850 can be turned into a 100hp block if more power is desired. Just depends on what boat you're going to run. It'll have to have a hp rating for twin setup, so anywhere from 140hp to 200hp! Transom's got to be wide enough and strong enough to hold 2 of these Beasts as well. The 700 models are quite a bit skinnier and lighter than the higher-hp versions and won't put quite as much of a dent in your wallet, either. Keep in mind that twin 700's will eat up to 14 gph at full throttle, 800's 16 gph, 850's 17gph, 1000's 20 gph! That's a lot of Cubic Dollar$ going into the lake! Thanks for the insight. 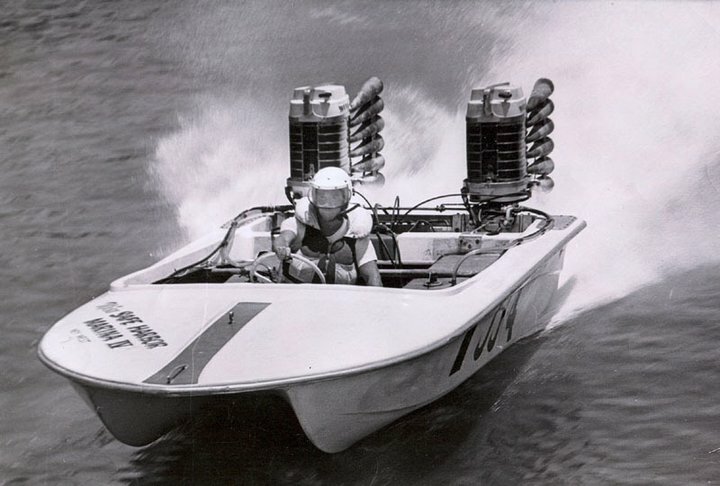 I have several vintage boats but not one that would handle a twin tower of power setup. I would really like to see them on the back of a 1959 South Seas Samoan, but I did see a Power Cat on this site for a reasonable price. I think I can handle the restoration of a boat, but I don't feel like I have a handle on what it would take to get some twins built. I'm not a racer nor am I looking to set any water speed records. I have always liked to look of twin tower of power (T-TOP's). I know there are a lot of variables to nail down a number but I'm just trying to get an idea of what to budget for. So if the 850 and 1000 share the same CID, does the stock extra HP come from a different stroke? And what is the weight difference between these two? I like the look of cloud white, so taking a 1000 power head bored 20 over and bolting it to an 850 body sounds rather interesting. On something as light weight as an 18c power cat would probably put it in upper 50's mph range??? I would expect that twin 1000's on a Powercat would give you speeds approaching 70+! 200hp ain't nothing to sneeze at! On the 90-c.i. powerheads, the bore and stroke are identical. Weight is identical as well. The extra hp on the 1000 comes from larger-bore carbs, larger reed stops, and a "tuned" exhaust plate. Just installing the 100hp carbs on the 850 will make a noticeable difference, but for ultimate power you have to split the crankcase and modify the reed stops so the reeds open more (i.e. "breathe" better), and also install the updated 100hp inner baffle (for better exhaust tuning). Years ago I was running a modified 850 with 100hp carbs & the tuned exhaust baffle. I didn't know about the reed stops or I would have done that, too. 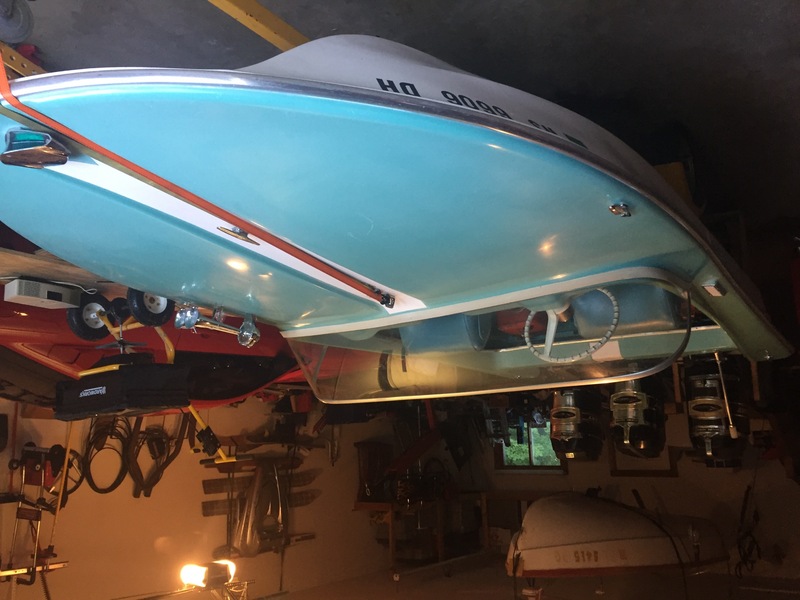 It was very strong and on a 14' Fiberform V-hull runabout would pull a skier like crazy, and top out at about 50mph on the lake with an old, clapped-out, 2-bladed aluminum "speed" prop. No doubt I could have pulled more speed out of it with a decent prop. Anyway, I burnt that motor up on the 4th of July one year when it lost a water pump. Tore it down, worked 'til midnight all week and was skiing with it the next week! Wish I had that much energy now!! I ran the living tar out of that motor after that, and it never failed. 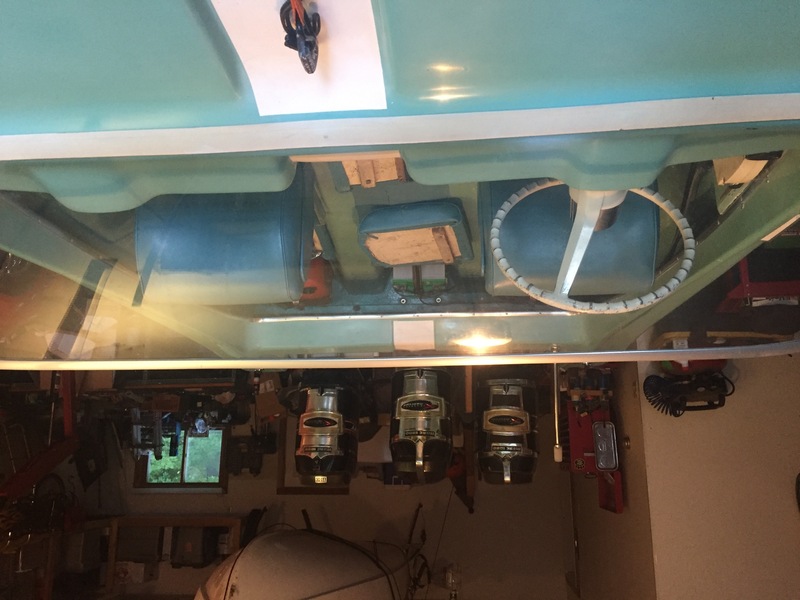 A good friend of Doc Frankenmerc is running a 1000 powerhead (that the Doc put together, BTW) on an 800 base, and he recently got his 13' custom-built, beautiful runabout up to 63 mph on our local Crescent Lake. That's really moving! Peter is a contributor here, check out his "Frankenmerc Top Speed" posting and watch the thrilling video he took. It'll get your blood boiling for some Classic Mercs! I remember dad asked an 18c Powercat owner with twin 110 Mercs how fast he could run and the reply I recall was cracked into low 70ÃÂ¢ÃÂÃÂs.. I would bet Frankenmerc 1000 powerhead engines built by the Doctor and put into cloud white motor cases would likely crack 70 or certainly near it one side or the other. That would be one sharp rig. I am sure if you contact Powercat himself on here, he likely would be able to give you great information on the Powercat and what each model can do. Mr. Danny Leger. That twin set up will get some attention, so add some extra time every time it makes a public appearance because someone like me would love a closer look and hear the boatâs history. Good luck. No- I am not going to do what you see in the pictures, but fun playing in the garage. TheToyBox did triples on an 18dc and knows his stuff. My 15T is too short and shallow short shaft to get too crazy. Just trying to throw some gas on your burning fire lol.